Dion Sembie-Ferris scored twice for Peterborough Sports at Welwyn Garden City. 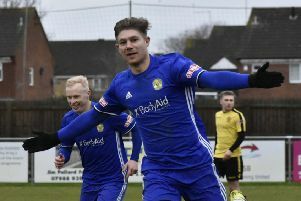 Peterborough Sports are five points clear with five games to play after a come-from-behind 3-1 success at Welwyn Garden City in Division One Central of the Evo Stik Southern League last night (April 2). The city side completed a hat-trick of away wins in eight days to take a firm grip on the title race. Sports also have a goal difference advantage on sole rivals Brosmgrove Sporting. Sports had to recover from conceding the opening goal in the 34th minute last night, but crucially former Dover Athletic player Jim Stevenson equalised just before the break. Former Colchester United player Dion Sembie-Ferris then scored twice in 10 minutes in the second half to seal a 26th win from 33 league games this season. Sembie-Ferris now has 20 goals this season. Sports are back in action on Saturday when hosting play-off chasing Sutton Coldfield Town at the Bee Arena (April 6, 3pm). Stamford AFC made amends for their weekend horror show by denting the play-off hopes of Tadcaster Albion at the Zeeco Stadium last night. The Daniels won 2-0 with a goal in each half from Joe Burgess and Jon Challinor. Gregg Smith saw a late penalty saved for Stamford who are now 10th. The poor form of Holbeach United in the United Counties Premier Division continued as they went down 3-1 at Oadby. The Tigers have picked up one point in their last four matches. Spencer Tinkler claimed a consolation goal last night. Deeping Rangers take on Grimsby Borough in the Lincs Senior Trophy Final at Lincoln United FC tonight (April 5, 7.45pm). Division One Central: Welwyn Garden City 1, Peterborough Sports 3 (Sembie-Ferris 2, Stevenson). East Division: Stamford AFC 2 (Burgess, Challinor), Tadcaster Albion 0. Premier Division: Oadby 3, Holbeach United 1 (Tinkler). Division One North: Downham Town 1, Wisbech St Mary 0.